Toss oyster mushrooms in olive oil then season with salt and pepper. Roast in a 400° oven for about 20 minutes or until slightly crispy on the edges. Mix Greek yogurt with a drizzle of olive oil and some minced garlic to make a sauce. Heat a generous drizzle of olive oil in a pan, add a shake of both red chile flakes and smoked paprika. Add chopped walnuts and cook until the walnuts are toasty and coated with the red chile oil. 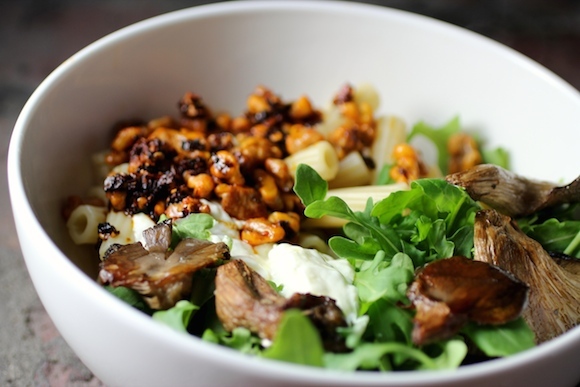 Place a relatively equal amount of cooked rigatoni and arugula on each side of a bowl. Add some crumbled feta. Spoon yogurt sauce over the top. 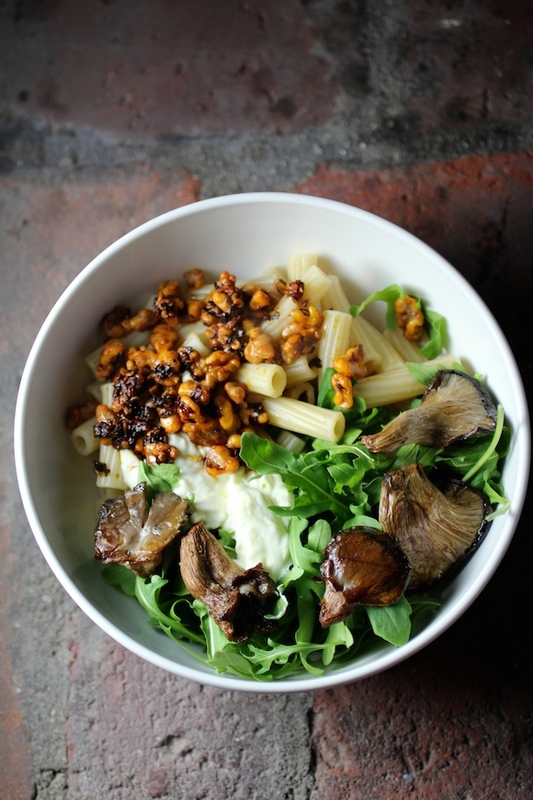 Then spoon chile walnuts including the chile oil over the pasta, and arrange oyster mushrooms over the arugula. For presentation, serve in a semi-deconstructed manner, then have diners toss and enjoy! My, but everyone’s cooking Jerusalem! All these Mediterranean flavors are so tempting, and the dish looks beautiful! Love Jerusalem and love your take on this, Lori. It seems easy, gorgeous, unusual and maybe even tasty. Will definitely try it. Love to eat like this — equal parts pasta and vegetables cuts down on those starchy carbs. Must try chili walnuts!! Lori Lynn’s take of Yotam Ottolenghi . . . brilliant: but what else could it be!! 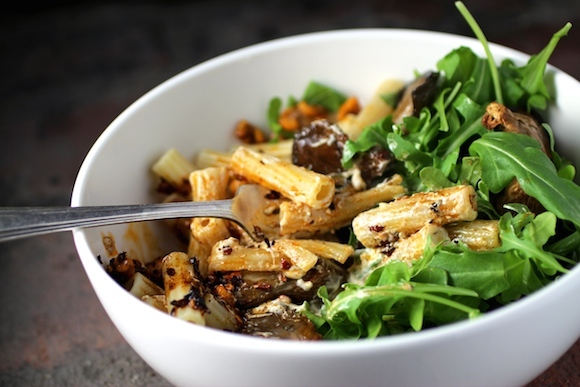 I love the look of your Ottolenghi inspired pasta dish. It had to be delicious. I love all of Ottolenghi’s recipes…………this one looks amazing as usual. Hope you are well. I am sorry I have been such a stranger! I love Ottolenghi’s recipes as well, someday I love to go to London to visit one of his establishments. Beautiful pics!